Are you ready to move beyond basic begonias and ordinary ivy in your kitchen, living room, or office? The world of houseplants is much more grand than the selection at your local home improvement store would lead you to believe. Thanks to online plant purveyors and the legwork of plant collectors who scour remote regions looking for new specimens for our homes, you can cultivate plants that are normally found only places like Madagascar or South Africa. Although these plants are unusual or even rare, they are no more difficult to grow indoors than any other houseplant. 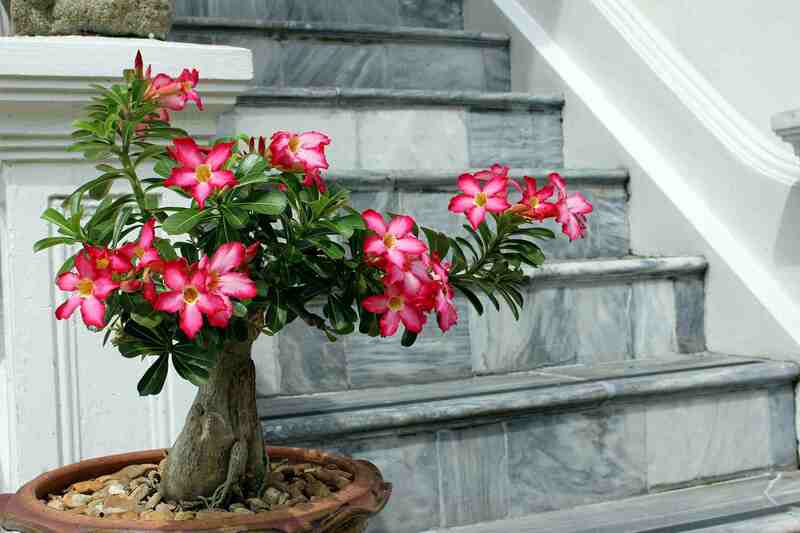 The desert rose, Adenium obesum, grows in the arid regions of Africa and the Middle East. True to its name, the desert rose thrives in hot, dry conditions. Although the plant resembles a bonsai tree in form, the swollen trunk is an adaptation for storing water in drought conditions. Give your desert rose high levels of light and good drainage. It's natural for plants to enter dormancy in the winter, so don't be alarmed if leaf drop occurs. Keep it in a cool sunny window and when outdoor temperatures rise above 70 F, give it a vacation on the deck to spur new growth. The banana shrub is named for its sweet tropical scent, but it is not related to the fruiting banana tree. Michelia figo plants are a member of the magnolia family and exhibit similar cup-shaped blooms on compact shrubs that usually don't exceed three feet in container culture. The banana shrub is a middle-of-the-road plant in all of its needs; provide it with partial sun, moderate watering and average room temperatures, and it should thrive. The climbing onion (Bowiea volubilis) is a great specimen for those new to houseplants, as it tolerates a wide variety of environments and shrugs off neglect. The bulb puts out vigorous shoots of lacy foliage in the spring, and goes dormant in the fall. Climbing onions need a small trellis to support their growth. Give your climbing onion full sun and keep it on the dry side. Club moss has a low profile that fits in so well in contemporary homes. Salaginella does well in low light conditions, but it requires a humid environment to thrive. This is the perfect plant for a mini terrarium where it will add cheer to your windowsill throughout the seasons. Coffee arabica is indeed the same plant that keeps you in java, although you might get a caffeine headache waiting for enough berries to mature on your coffee plant for a viable harvest. Sporting attractive glossy green foliage, the coffee plant is a member of the gardenia family, so you can expect fragrant white flowers to precede the red berries that yield coffee beans. Coffee plants appreciate humid conditions and moderate light. Plants can grow quite large, but you can prune them back severely and they will grow back to flowering size within a year. Huernia zebrina is one of the most bizarre-looking plants you can grow. The waxy flowers look like plastic, but these very real plants are native to South Africa. Like other members of the cactus family, lifesaver plants need sandy soil and full sun for best vigor. Keep the petite plants on a windowsill where you can admire their strange anatomy up close. Alternatively known as jewel leaf, limestone rock plant and carpet leaf, this succulent oddity needs rocky soil and high light conditions like that of its native South Africa. If you're lucky, your Titanopsis calcarea may even produce a yellow bloom among its warty leaves in the winter months. It's no surprise that the sensitive plant once supported the belief that plants have nervous systems and feelings. Though we now know that the sudden movement of leaves in response to touch is a function of the movement of water in the plant cells, the reaction of Mimosa pudica still fascinates the observer. The sensitive plant is considered a weed in tropical areas; lots of sun and moderate watering will yield successful results for this unusual houseplant. Bat flowers are one-of-a-kind with their moody dark petals and long whiskery growths categorized as bracteoles, which are thin specialized bracts growing from the flower stalk. If you can grow an orchid, you can grow a Tacca chantrieri. They both love filtered light, high humidity and excellent air circulation.